When a Maine stonecutter named Calvin Tibbets ventured to Oregon in 1832, it was looking more British than American. 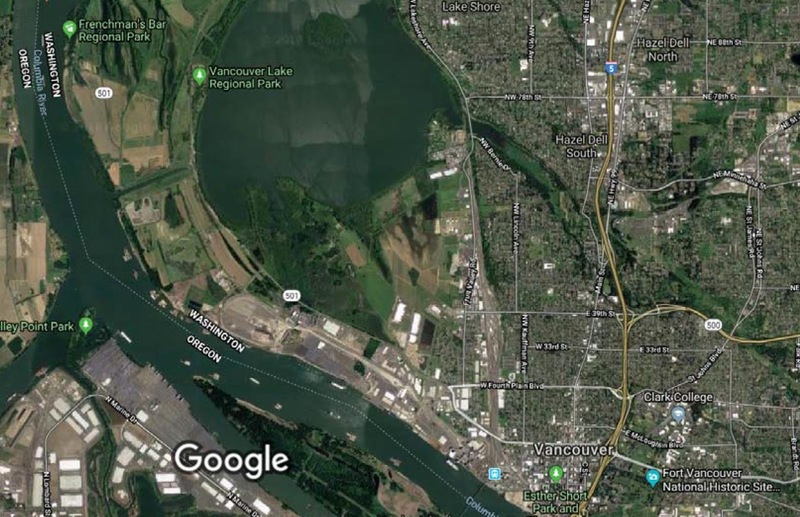 Hudson's Bay Company, the Crown's proxy, had virtual control of the region and its employees had begun retiring to farms along the Willamette River. Americans in Oregon before Tibbets had been explorers, fur trappers, scientists, and merchant sailors. His objective was different: to settle permanently and make it part of the United States. So he got along with French Canadian and Indian neighbors and set the stage for fellow American settlers as they arrived. First missionaries, then retiring mountain men, and finally, wagon train pioneers arrived in such great numbers that British interests were overwhelmed. Tibbets died of cholera in 1849, living just long enough see his goal achieved and his Clatsop Indian wife, Louisa, died soon after. Orphaned daughter Grace was sent to a Catholic school in Oregon City, married a black pioneer, Richard Sorter, and moved to Kalama, WA. Grace and Richard would not have been welcome at Oregon Pioneer Association meetings, so the name of Calvin Tibbets faded into the shadows of Oregon history. My goals in writing Calvin Tibbets: Oregon's First Pioneer were to shine a bright light on Tibbets by making the case for his being considered Oregon's First Pioneer and to share this innocuous but ubiquitous fellow's many adventures with fans of early Oregon history. The posts that follow expand on some of those adventures or veer onto side trips taken in preparation for public presentations. Snippets of book coverage of any topic of interest can be viewed for free using the Look Inside feature of its eBook version, which sells for just $5.49. The paperback edition can be purchased for $9.95 at bookstores listed on the Availability page or by clicking on the cover image in the right column. On June 16, 1849, Calvin Tibbets and his Clatsop Plains neighbors registered the schooner they had built, christened the Pioneer, in Astoria before sailing it to San Francisco loaded with farm produce and lumber to sell to gold miners (see pages 38-40 of Calvin Tibbets: Oregon's First Pioneer). John Adair had just arrived to serve as U.S. Customs Collector for the newly established Territory of Oregon on April 3rd. For the first couple weeks, his family was hosted by Nancy (Mrs. James) Welch. He worked there while awaiting completion of a formal customhouse. In June he was working out of the house of John McClure, who was away. 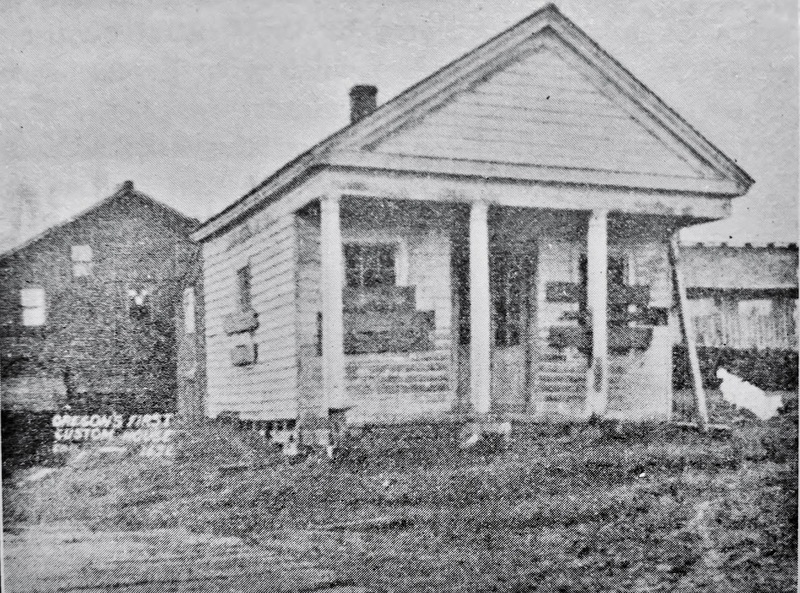 Adair's wife Mary Ann described McClure's house in her memoirs as a "shanty," though it was an improvement over the place their family had just left. That "shack...later lived in by Mr. Holman" had a fireplace that wouldn't draft and, because it been raised to stand over water at high tide, Clatsop Indians caused a fright one night when they poked their heads up through the loose floorboards while taking refuge from the rain in the space below. 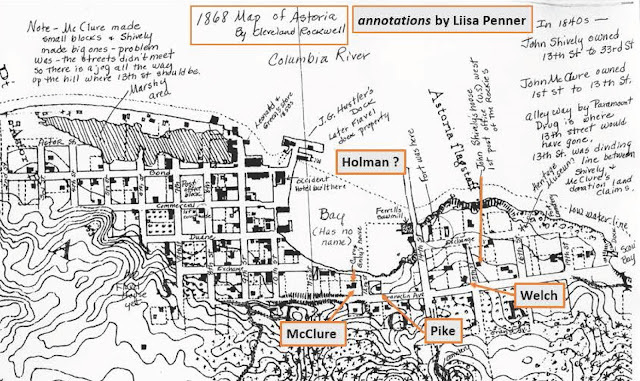 Given John McClure played such an important role in building Astoria, I was surprised to learn that the location of his house had never been pinpointed. With the help of Clatsop County Historical Society's archivist Liisa Penner, John Goodenberger (architectural historian who guided reconstruction of the second custom house shown in the photo), early survey maps, the distinctively steep roof of the Pike house, and Clatsop County Clerk records, I was able to place McClure's house in the modern driveway between Peace Lutheran Church and its daycare center, housed in a building still referred to as "the Kirchoff House." Part of the church now stands where Judge Cyrus Olney built his house soon after buying out McClure in 1858. The Hughes-Ransom Mortuary has replaced "Pike's Peak." As I drove through Astoria, ahead of a presentation at the Columbia River Maritime Museum which included these findings, I appreciated for the first time how much the city's landscape had changed over time. Most notably, Marine Drive between 10th and 14th which crosses what had been the little bay in front of McClure's house, now filled in over buried docks that supported commercial and industrial buildings in the early 1900s. I have not managed to locate "the shack," but the "Mr. Holman" who Mary Ann Adair said lived there after her family was most certainly James D. Holman. Published biographies show him moving from Oregon City directly to his development at Pacific City, WA in 1850. But an obituary for his wife Rachel in the August 4, 1900 Astoria Budget reported them having lived in Astoria for several years and on July 24, 1930 the paper reported daughter Kate being born there. Oregon State Archive records confirm Kate's birth in Astoria on December 10, 1856. In Nellie Flavel's 1885 diary, published in the Spring 2001 Cumtux, she speaks of Kate as a close friend. 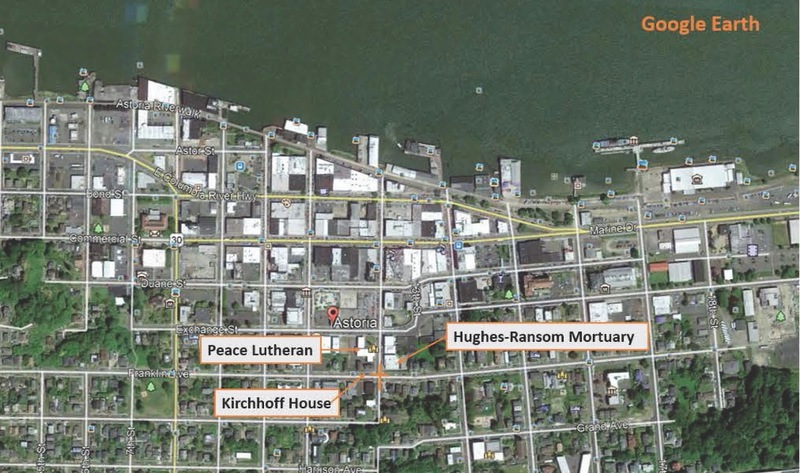 James and Ruth buried an infant daughter, Elizabeth, at the Clatsop Plains Pioneer Cemetery in 1854. Their son Frederick was born in Pacific City in 1852. He went on to become a prominent Portland attorney and President of the Oregon Historical Society. Given his wealth and Mary Ann Adair referring only to him, James likely lived in the shack on the beach for a short time while finding more suitable quarters for his family where they lived intermittently during the Pacific City years. After it failed, they moved to Portland permanently. In the 1870s, James developed Ilwaco on the same land claim. An introduction to Calvin Tibbets and more stories like this can be found on the Home page. 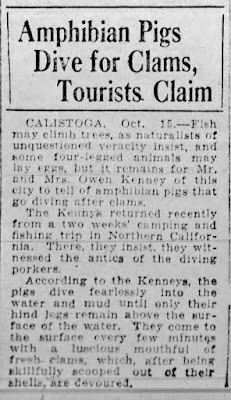 It was here that I first learned that a pig would voluntarily dive under water. Dr. McL assuring me that he had frequently witnessed this curious anomaly and watched them until they reached the shore & dispatched their prize which was nothing more nor less than a species of clam or oyster. My father, Art Sutherland, reminded me of this incident when I told him I'd be presenting at the Fort Vancouver Visitor Center May 19. He first mentioned it while printing Emmons' journal by hand years ago so that I could more easily read it. I wasn't sure I wanted to put this in my PowerPoint because it seemed far-fetched. I thought McLoughlin might be pulling Emmons' leg or trying to sabotage his report. But I decided to look into it. ...the pigs dive fearlessly into the water and mud until only their hind legs remain above the surface of the water. They come to the surface every few minutes with a lucsious mouthful of fresh clams, which after being skillfully scooped out of their shells, are devoured. This reminded me that when we rafted Vancouver Lake as kids we knew better than to get out of the rubber boat because the mud was deeper than the water. And I chuckled at the image of hundreds of HBC pig rumps jiggling about on the surface. On YouTube, I found videos of wild pigs swimming in the Bahamas and a group of them trained by a Chinese farmer to jump 10' from the end of a chute into a pond. 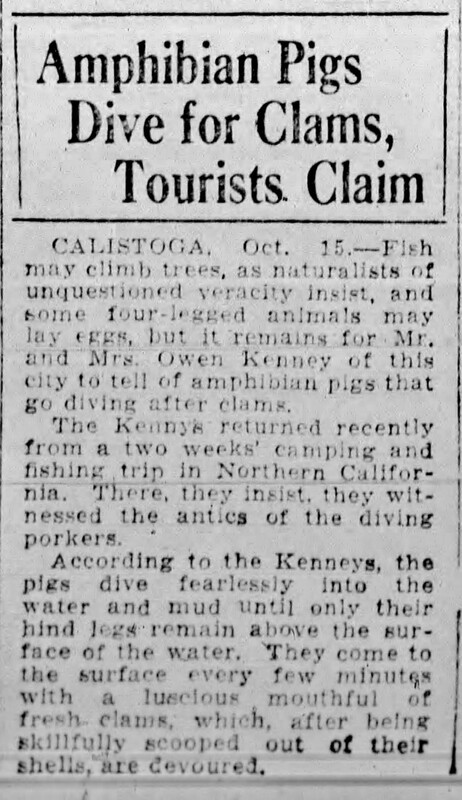 I found no video of pigs scrounging for clams, but it now certainly seems credible that they were capable of learning how to do it. A couple farms still operate on the shores of Vancouver Lake, but none of them raise pigs and I imagine that seeding the lake with clams to feed them would be outrageously expensive if they did. Perhaps Clark County could make it a feature of their Vancouver Lake Regional Park. An introduction to Calvin Tibbets and more stories like this are available on the Home page. Jerry Sutherland . Simple theme. Powered by Blogger.